Need some quick appetizers or snacks for a party? We have some great ideas for you! Keep a few packages of puff pastry in your freezer, and in no time you can have Salmon Cream Cheese Pinwheels, Dill Puffs, Parmesan Herb Straws, and Apricot Triangles or countless other treats. 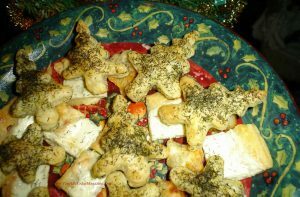 Cut into squares or festive shapes, fill with a small amount of your favorite things like jam, flavored cream cheeses, or finely chopped cooked meat, mushrooms and herbs. Pinch together the edges, and then bake on a cookie sheet lined with parchment paper at 400 degrees until golden brown. (Parchment paper works much better than greasing the cookie sheet. They slide right off!) Watch carefully so that neither the puffs nor the paper burns. They are usually done in around 10 to 15 minutes. While we won’t pretend that the finished products are anything resembling healthy, if you have to make something at the last minute, they will save you sleep, and that is healthy for you! Don’t worry if you don’t fold it or cut it perfectly. The puffing changes the shape a little anyway, and they’re still delicious and tempting in any shape. You might just find the kid inside you as you experiment with different shapes and fillings! Bunches of red and green grapes with cheese cubes make attractive trays and require no prep beyond washing the grapes. If you need to fill out your party table, nothing is easier than a variety of dips and spreads along with crackers. Small slices of marbled rye or french bread are also good for spreads and look pretty on the table. To save time, you can purchase the dips and spreads when you buy the crackers and bread, but if you want to make some yourself, here are a few easy ones. age of lowfat cream cheese in the microwave for less than a minute in a microwave-safe dish. Stir in 1/2 can of whole cranberry sauce. Combine a small can of boneless, skinless salmon with a package of low fat cream cheese or yogurt in the food processor along with dill and 1 tablespoon of lemon juice. 1 small package frozen chopped spinach, washed, thawed and cooked just until crisp tender. Add just enough lowfat mayo or lowfat yogurt until it gets to “dip” consistency. Dice canned water chestnuts and add to dip. Season to taste. Vegetable trays are a popular party feature. Save yourself a lot of work by selecting vegetables that don’t require chopping, such as baby carrots, cherry tomatoes, black and green olives, pea pods, etc.